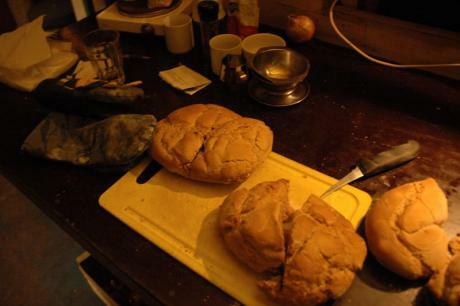 everybody was out dumpsterdiving for the open dinner, Robino was standing in the kitchen making bread. It was a beautiful, typical Dutch day: sunny, then clouds and rain, and back to sunny again. And, we were enjoying it at the one-and-only and most gezellig Amsterdam party of the year: de Roots-festival. Great food, wonderful people, and four stages in Oosterpark, with a large variety of bands from here and everywhere: flamenco, rap, reggae, ska, and anything else that comes with roots. While the last band played we danced wildly, as if a storm was brewing, threatening to destroy our party. Let's enjoy this through the very end. And... so it went. On the train I wrote a letter home to friends and family describing my time at the casa. I've pasted it here for everyone's enjoyment (minus the part where I talked about how much I secretly hated everybody). "My first day at "Casa Robino," I asked where the bathroom was. Simple question, I thought; it should have a simple answer. "Just open all the doors - you'll find it," was the simple reply", is how Charlie the First Brigham the Fourth, aka Caveman, starts his latest entry on his website. What Caveman writes is what comes closest to any description of what actually takes places in this casa, and is a must read for all who is coming here for the first time. Enjoy, here it is. "No hand-holding, no directing; power and responsibility are refreshingly balanced in the Casa." The casa was my only reason to come to Amsterdam and had a lot to do with why I stayed. For the most part, I was unaware of the fact that I was living in Holland (except for the weather, which kept me grounded). In fact, I was not living in the Netherlands at all; I was living in the casa, whether inside or outside of it. In casa, I could dare to be myself and witness the reflection in others. In casa, I grew a family. In casa, I could travel by means of standing still. Stand still senza stand-by: motionless change, seamless nomadism, boundless voyage. - I will not kiss you till you brush your teeth. - I kiss you whenever I want. Conversation from last night at bbq party.